This can be caused by mould/mildew growing on the air conditioning evaporator, first check that the drain tubes from the heater system are clear. To test simply pour water into the grills next to windscreen, it should poor straight out the bottom of the drain tubes onto the floor, if it fills the heater box up you need to clear the tubes from dead leaves etc. If all is well, you will to buy an antibacterial spray to kill the bacteria growing in the A/C system. The 0ne I am demonstrating is very easy to use and will fix most problems without the need to remove any parts, however if the problem is very bad you may need to remove the pollen filter etc. and spray directly into the air ways. A simple ten minute treatment, and your whole car is refreshed, with upholstery and carpets deodorised to bring back that new car smell. Ensure all windows of vehicle are shut. Remove articles that do not need to come in contact with spray. 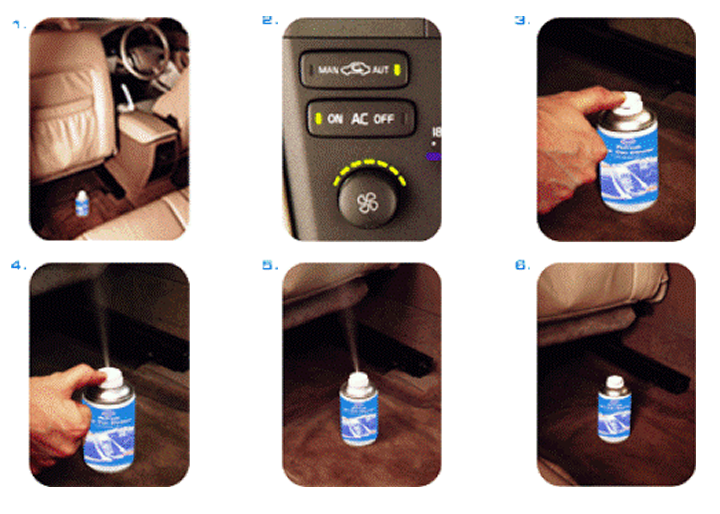 Push front passenger seat either fully forward or backwards to create the largest area for aerosol to stand. Switch on the air conditioning setting the system to re-circulation on full fan power. Make sure dashboard vents are open. Depress the nozzle lever into the lock-down position making sure that the unit is pointing away from eyes and face. Exit the vehicle making sure that all doors are closed. Once the can is fully discharged, allow the air conditioning to run for a further 5 minutes. Open the car door, turn off the engine, and wipe away any moisture that has appeared on dashboard or fittings. Dispose of empty can safely. This is normally something like a plastic bag melted on to the catalytic converter, pull off as much as possible but be very careful as the catalytic converter is very hot and will burn you very easy. If the engine revs up but the car doesn't accelerate very well and there is an unusual smell, it is the clutch slipping.